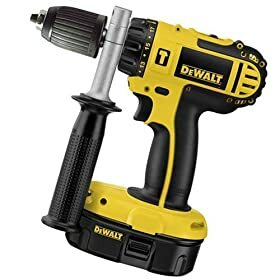 I own lots of De Walt tools, but I have noticed a serious drop in their ability to produce a durable cordless drill recently. There is no doubt that De Walt have bright ideas, and their products, on paper, are very impressive, and push the boundaries of what you expect a tool can do for you. I realy like their cordless nailers (I have two!) However, this drill has some serious design flaws. Be aware that the front torque selector, spindle, gearbox and a weighty Jacobs keyless chuck (I do like Jacobs chucks) are held inside the clamshell by...by... a plastic location ring groove in the clamshell body, that ring grips the gearbox, and which measures no more than 1/16th or 2mm in indent depth. Consequently, let your tool heat up, or use it under torquey conditions and guess what? The entire front housing loosens up. On my drill I can get the chuck housing to move an 1/8th or more (depending on how hot the plastic is) in any direction, yet the clamshell is gripped firmly and doesn't move at all! Other than this inadequet plastic groove the frameless motor had location cut outs in its magnet body to try and stabilise the front end, but since the motor is only held in place by the pressure of the screwbolts holding the clamshell shut this feature is limited in what it can achieve. Maybe i've just got a dudd, but i doubt that this drill issufficiently well engineered for the trade/contractor market, which is a shame. Let's hope De Walt realise and redesign this into a really decent bit of kit that can rival the Japanese blue tools that I will be using from now on for cordless drills. I had been buying some things by Amazon, and this is my best shopping. It good that this product has other battery because when anyone is working continue for long time, people doesnt need to stop their work and continue after. All caracteristics that describe in the page its true, add, this drill is compact, perfect caracteristic when you need to work in hard positions. GOOGLE DEWALTOWNERSGROUP IF THE LINK DONT WORK. GO TO TOOL REVIEWS ON THE SITE. LOOK INSIDE OF THESE COMPACT DRILLS. I DONT NEED TO TELL YOU ANYTHING ELSE. GREAT DRILL. BUILT TOO LAST. THIS WILL END A LOT OF ARGUMENTS OVER WITCH TOOL MANUFACTURERS ARE BETTER. ITS ALL WHATS INSIDE THAT COUNTS. SOMETIMES MAKING SOMETHING LIGHTER IS NOT THE BETTER TOOL. THINGS GET SACRIFICED. LOTS OF PLASTIC IN LIGHT WEIGHT THINGS TODAY. PLASTICS BAD IN TOOLS I THINK, BUT CHINA PLASTICS EVEN WORSE. REVIEW YOUR PURCHASES IF YOU DONT WANT TO GET THE SHAFT....I THINK DEWALT DONE THIS JUST RIGHT. VERY LITTLE PLASTIC INSIDE.. KEPT IT HEAVY DUTY. This Dewalt cordless Hammer Drill is the best hand tool I have bought in a while. It replaced a dewalt and has performed well. I put it to work building walls in a barn the first week I got it. I would reccommend it to any do-it yourselfer like me.